NEED A CUSTOM QUOTE ON SOME TRAYS? YOU CAME TO THE RIGHT PLACE! 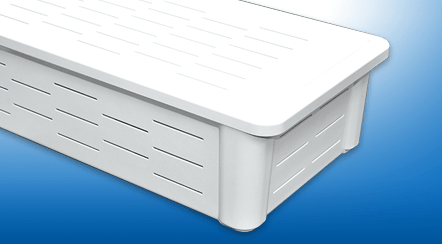 MFG Tray sterilization trays are molded from high-strength, glass-reinforced composites. These specially slotted containers are designed for years of severe service in harsh gamma and autoclave environments. The outstanding physical properties for which these trays are known are a result of the special formulation of resin matrix and glass reinforcement. MFG sterilization trays may be stacked, with or without the optional lids, to save space and streamline handling and product storage. The inherent dimensional stability ensures easy integration with automation machinery. 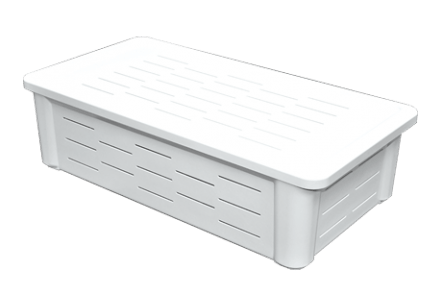 Our sterilization trays can be used in continuous temperatures ranging from -60° to 250° F (-51° to 121° C) and are resistant to oils, solvents, greases and mild acids as well as alkaline solutions within a pH rating of 3.0 – 10.0.
containers, trays, boxes, flats and totes for material handling in the metal working, plastics and electronics assembly industries, as well as in food service, confectionery and pharmaceutical processing. MFG Tray continually develops customized solutions for specific material-handling challenges and applications. Customers are encouraged to contact MFG Tray to discuss any unique handling and design requirements.